We are back home and so thankful for minimal problems! Our neighborhood suffered power outages, trees down, TONS of debris and other minor problems. Fortunately, that's it! Neighbors helped neighbors and we got everything cleaned up. Jon flew up to OKC to make the drive back with us. 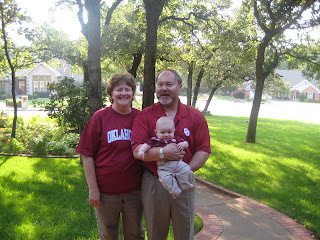 He was greeted by my parents in their OU shirts and JD in a Sooners onesie! We managed to get a picture before Jon took it off! It was a much easier trip home. 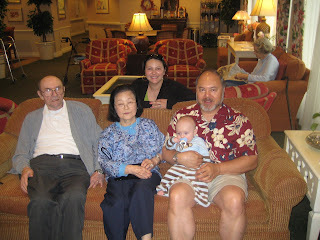 Jon David and I enjoyed our visit and I know my parents were happy to have us. 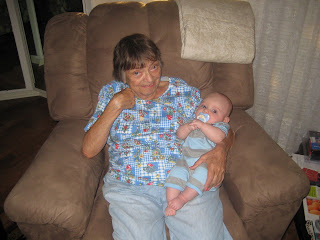 Well, happy to have Jon David, I'm just there to feed him... We took lots of pictures with his great-grandmother (my Oma) and his great-grandparents on my father's side. I am so thankful that he got to spend time with them! Get that awful outfit off that baby!!! You can tell by his face that he knows that it is wrong ;) He's adorable and soooo big.